Titanfall (Xbox One, PC) is the game that has brought me back to online gaming. I don’t tend to play multiplayer games much these days. Maybe it’s because I can’t be bothered playing with the whiney 12-year-olds that seems to be online when I am (I always mute other players anyway, both on my team and on the opposition) or maybe it’s because my ageing reflexes just can’t cut it with the young whippersnappers that populate popular online game: I’ll often fumble trying to change a weapon as a foe approaches, only to be taken down by another who has snuck up behind me. I’ve dabbled in Halo, Battlefield 4 and other online games I’ve tended to give up after a couple of days (and a few hundred deaths). Titan fall is different, though. The debut game from Respawn Entertainment (a development studio made up of a lot of people who worked on Call of Duty), Titanfall has, somehow, captured me with its mix of giant robots and fast, frantic combat. It’s prob ably the novelty of controlling the game’s titular Titans that has swayed me but every day since the game launched I’ve played several matches a day, keen to level up my avatar. I think I’m sitting at level 18 at the moment, which isn’t that impressive compared to the high rankings of other players, but it’s much higher than any rank I’ve got in any other online games. It’s clearly doing something right if it can capture the attention of a gamer who usually despises online gaming. At it’s very heart Titanfall is similar to the bulk of online games out there: pick a character and Titan class (Atlas, Ogre or Stryder), drop onto a map, take out the enemies/capture the flags/hold the markers, re-spawn when you die – but it has a notable point difference in that once a match is over, it’s not actually over: The match doesn’t end until the victors have either stopped the defeated team from boarding a jump ship or the defeated board the jump ship that evacuates them from the war zone. If I’m being honest, I’ve hardly made any evacuations when I’ve been on the defeated side (which is many times) – maybe six or seven in the numerous games I’ve played – but it’s thrilling trying to make it to evacuation point without being spotted by enemy foot soldiers or Titans. Do I wait until the last minute to sprint for the waiting ship, fingers crossed that I’ll make it on time? Or do I hide near the pick up zone, cloak then hope like hell I don’t get spotted? 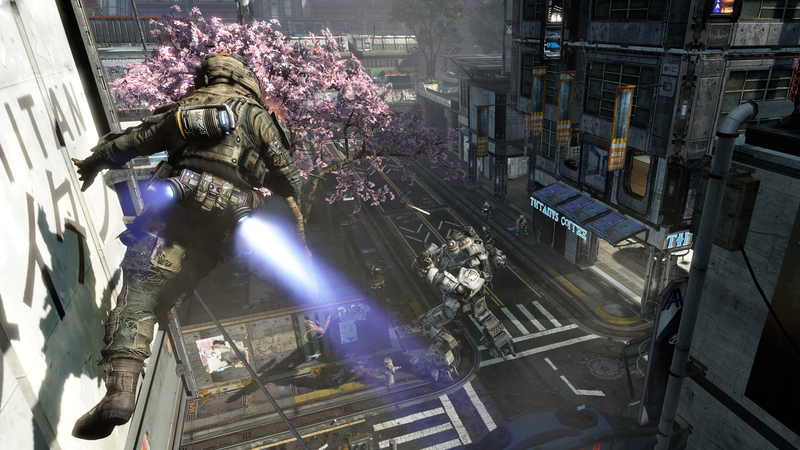 Rodeoing a Titan: this .gif shows just one of the neat things you can do in Titanfall. Players start each match as a pilot class (there are three classes available) and the more kills you get the sooner you’ll gain access to your Titan, a heavily armoured and armed mechanical robot that drops from the sky with a ground shaking thud. But, often, I found many times that I don’t actually call in my Titan during a match, despite the fact that I could. There’s something exciting about being a pilot parkouring around rooftops and walls, activating your cloaking device then dropping silently onto the top of an unsuspecting enemy Titan – it’s called rodeoing – , ripping off a maintenance hatch and blasting its innards, causing it to become doomed and exploding into pieces just as you jump off. That’s the thrill: Not duking it out with several most likely higher ranked Titan, where the odds are more stacked against an inexperienced pilot. That said, it’s great ejecting just as your Titan’s core goes nuclear, propelling you into the air, the resultant explosion destroying the foes in the vicinity. As you progress through the game you’ll unlock more tech and weapons for both your Titan and your pilot (sidearms, rifles, ordnance), and at first I favoured the assassin’s smart pistol – a sidearm that locks onto a target before you can pull the trigger – but I quickly realised that while the smart pistol is useful against the AI- controlled grunts that make up the numbers during matches (there are only six human players each match: The rest are AI-controlled minions) that usually just stand there and shoot, it’s not so great against human opponents who are more unpredictable, making locking onto them all that much harder. There will come a time when Titanfall becomes repetitive and I’ll put it down and move onto something else: That hasn’t happened yet but it’s only been a week or so. I’m hoping Respawn will counter that potential repetitiveness with more maps and new game modes. I’d also like to see match making done a little better: Many of the matches I played had Level 35 players squaring off against Level 10 player. Hardly fair, really, is it? Perhaps Respawn can work out someway to have similarly skilled pilots against each other. Titanfall will probably result in increased sales for the Xbox One – lets face it: It’s one of the few games worth having on the console at the moment – and it will probably have the same effect on other gamers as it did me but with no single player campaign, it’s got a limited appeal for gamers who love an engaging narrative. If you want a story-based game, Titanfall isn’t the one you want to pick up. Another downside for Titanfall is that because it’s totally reliant on an internet connection, if your internet goes down – which it will – you can’t play it. Keep that in mind. When the game first launched, my games were connecting to a data centre in the West Coast of the United States, giving pings of about 164ms – not ideal for online gaming where you want as little latency as possible – but since Australian servers came online late last week, I’m getting pings of 62ms, which is much, much better, and I’ve heard of gamers in Sydney – where the Aussie servers are located – getting pings as low as 18ms. Overall, Respawn has delivered a solid, satisfying game experience that will satisfy online gamers and has done enough to stand out from the stock-standard online games out there. Now the job for Respawn is to make sure it supports it so that people will keep playing it in the months and years ahead. 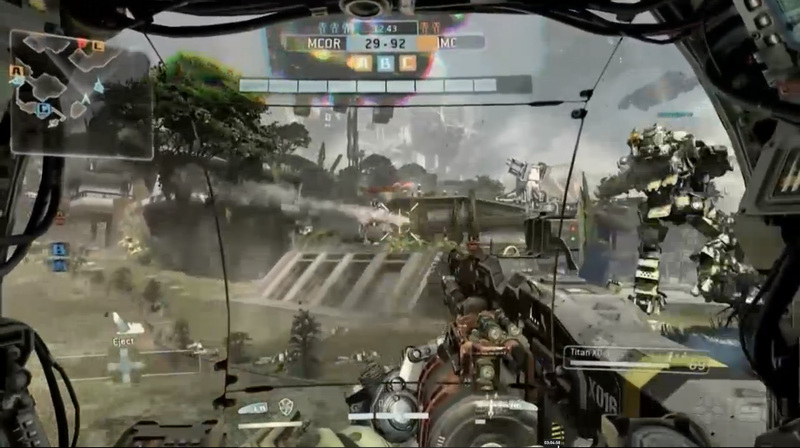 Uodate: I forgot to mention Titanfall’s burn cards, which, I guess, can be likened to Call of Duty’s perks. You earn burn cards as you progress through the game and while you can activate one as soon as each round starts, generally a burn card will come into effect once you’ve died and you re-spawn. Burn cards can range from anything to reducing the amount of time it takes until your Titan falls to extra XP for killing enemies to spawning a group of grunts around an objective to protect it to swapping out a particular weapon for a higher powered one. You can have three burn cards active at any one time, so you’ll often find you’ll swap and change while you’re in the lobby to find the one that will best fit the situation. Update two: I finally got around to trying out the so-called campaign mode. What a waste of time it is, to be honest. I don’t really know why Respawn bothered to tack it on, apart from perhaps trying to give a bit of backstory to the IMC and Militia conflict. The campaign is just online multiplayer matches with some narrative layered over it, but sneakily, the only way you can unlock two of the three Titan classes is complete both sides of the campaign. If I thought the campaign was worth playing, I’d be prepared to do that but I’m not, so I’m stuck with the Atlas Titan chassis for the foreseeable future.